The brightly coloured poison dart frog is a remarkable creature. Native to the jungles of South America, this group of frog species secretes toxins from its skin that was used by the local indigenous people to poison their blowdarts. 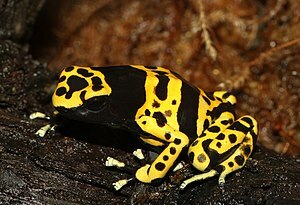 The most poisonous member of the family, the golden poison frog, is able to produce poison that’s strong enough to kill up to 20 men. So where does such a beautiful amphibian gets its poison from? For starters, they aren’t born with it and they aren’t able to synthesize it. Biologists have concluded that the frog gets its toxins by eating ants, centipedes and mites that have been living on poisonous plants. Such toxins build up in the body over time and the frog is able to withstand such a build up. Poison dart frogs that are kept in captivity contain much less poison due to their different diet, supporting this theory that they aren’t born toxic, but become so due to their environment and diet. To me there are four categories of people and it’s possible to be in more than one at the same time. There are those who are toxic because of their situation (especially the people around them) and the thoughts that they continually focus on. Those who add to the toxicity of those around them through their attitude. Those who diminish the toxicity of the people in their environment. Those who surround themselves with people who will add value to their situation and think optimistically. My question today is not which one are you. It’s what are you going to do to improve the attitude and level of enthusiasm of yourself and the people around you? There’s also a small caveat that goes with a post like this. I’ve seen people who go from job to job, blaming the toxicity of the organisations for negatively impacting their attitude. Don’t always expect a change of circumstances to give you everything you want. If, after a few changes of situations, you are still unhappy, perhaps you’re the source of the toxicity. You always make me smile and think! Thank you! Sometimes we can’t change the people we are around or not be around them. But, I have seen God continually work on me and give me the antidote to the toxin. 🙂 Not saying it’s always easy, but with Him, it’s doable! God bless you, Coach D! God as the antidote to toxins, love it. Thanks Debbie. I am learning this Lenten Season that I CAN be a very effective reducer of toxicity for those around me and CAN be one who attracts a lot of positive other people to come and join me. I just had to stop believing all the lies that I was a nerd and should just keep myself to myself and work alone! NOT SO! My wonderful blogging world has taught me this, especially people such as you, Coach! I enjoyed your use of the poison dart frogs to get a very good point across. It reminds me of the deffinition of insanity. Doing the same thing over and over again and expecting a different result. I encourage people to feed on the word of God which never produces toxin.